A biblical look at what true friendship is and an encouragement and challenge to achieve it. In a culture where online communications and communities can be set up in seconds, it is striking that loneliness is still rampant. Even in the church, a place where we might hope for an oasis of love and acceptance, we can find interactions awkward and superficial. It’s for this reason that Vaughan Roberts takes us back to the Bible, and challenges us to consider our need for true friendship. He’s both honest and clear in his approach as he shows us that knowing and being known by God is the hope we need to begin to deal with the sickness of our ‘self–love’ society. So whatever the state of your friendships, take heart and take hold of this book – because as you do, you’ll see that we can live out our true humanity as we sacrificially love others for God’s glory. Each chapter includes thoughtful reflection and discussion questions to help change us as we read, as well as practical suggestions for how we can make a real difference to our friendships. Such an important part of our lives and yet we so often neglect our friends - a good reminder from Vaughan about how to do better! Three hours. That's the time it took me to read this book, skim the reflection questions, work out which areas I needed to pray about more and send some texts to key friends who have been dropping off my radar recently. That was three hours well spent! 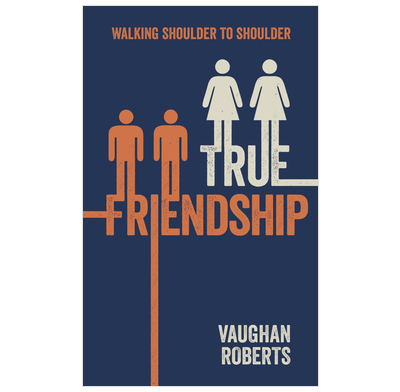 In this winsome and wise text, Vaughan Roberts explores a subject that is dear to our hearts but often poorly understood in a biblical framework - friendship. In a few short pages he shows that friendship is integral to what it means to be human - necessary if we are to live wisely as children of God and a great opportunity to give, receive and grow. Throughout the book, Vaughan is careful to walk the line - never encouraging us to become a stoic, looking soley to the needs of others nor advocating unhealthy dependency where our hope rests in other people. Instead, this bite-sized resource is a great spur to do friendship Jesus' way - aspiring to be children of God who give and receive love, nurture and encouragement to change.